For Those Who Launch and Lead. Acoustic panels by ATS Acoustics. Share the power of being believed in. I wrote the book Investing With Purpose because I am deeply grateful for the rewarding thrill ride that has come from attempting big things. I couldn’t have done what I did without a few people who believed in me. I want thousands (maybe millions) of people to courageously create the future they desire most. For that to happen, the book must find it’s way into the hands of the right readers, people who aspire to do work that matters. I know a bunch of people who aspire, and I’ll be giving them copies of the book. But I don’t know thousands of people like that. Every one of you knows someone with potential for big things in them. Maybe they are well on their way, or maybe they need a shot of courage. Maybe they could use some advice on where to start and how to gain momentum. I want to send people like that a copy of the book, with a little belief from you and me. Here’s a video summary of the campaign. Other videos about the book are here. 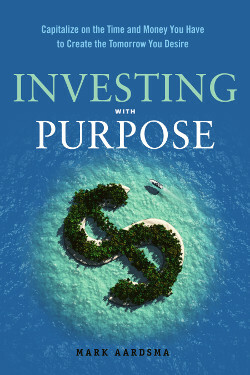 Anyone who has read Investing With Purpose may nominate one other person. If you haven’t read the book, you can read it as soon as it releases on Kindle or Nook (coming soon). Once you’ve read the book and take in what it’s all about, think of someone you believe in and want to give a boost to. Nominate them here. I will review every nomination, and while supplies last, I will send every qualified nominee a free copy of the book in the mail. I’ll include a personal note from you and me letting them know you believe in them, and urging them to go for it with courage. If you post about your nomination on social media, you can use hashtag #AllWhoAspire or link to this page to help spread the inspiration. You must read (or listen to) the book before nominating someone. This is so you can make an informed recommendation, and so the publishers who supported this book can sell some copies. I won’t ask for proof of purchase, we’ll use the honor system. You may not nominate yourself. You may only nominate one person, ever, so give it some thought. Nominations will be reviewed and accepted on a first-come, first-serve basis. If this offer receives a large response that exceeds my supply of books, I may select a subset of the most qualified nominees, in my sole judgment. No purchase is necessary to nominate someone. At my discretion, I may reject any nominations that don’t appear to be legitimate. Your nomination is not anonymous, your name will be included in the note I send. I may tweet or post about your nomination to encourage others. If you prefer, you may request I not do that on the nomination form. You and the person you nominate may receive emails from me in the future. My hope is you and the person you nominate will face fear and go for it. Whether that means building something financial, advancing a cause, or making an unsung difference to people who need you, it’s worth it. Thanks for making a difference with me.